This fragmentary inscription was discovered in the House of Ahiel. It is written in ink on a jar in formal handwriting. 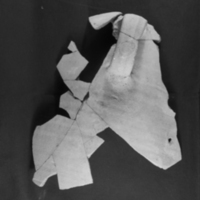 Sherds (broken pieces) from storage jars were often used as a writing surface, so the inscription may be unrelated to the jar or its contents.The inscription's meaning is difficult to understand, but it mentions three individuals by name. Two of the names mention Yhwh. There is also a desciption of each person. 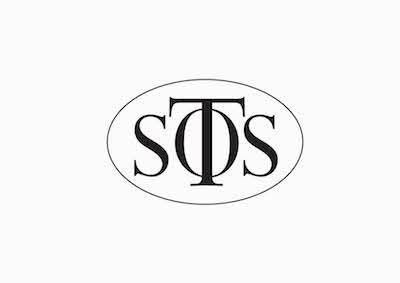 These are harder to decipher, but may be tentatively translated as:...]s son of Ahiel, who marks [?] rags...]yahu son of Hesedyahu, who gathers silver...]yahu [son of Y]adayahu, who gathers [gold ? ]Although the purpose of the inscription remains enigmatic, the House of Ahiel is named after the first individual named in the text. 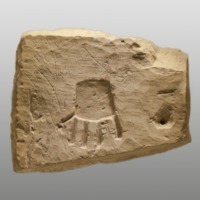 This inscription was removed from the pillar of a tomb at Khirbet el-Qom. It displays a carved handprint with some lines of text above it and two more lines of text on the lower left corner. The stone was smoothed over in preparation for the inscription with a tool that left scratches in its surface, and this, combined with natural faults in the stone and the presence of ghost-letters* has led to considerable debate over the translation of the text. 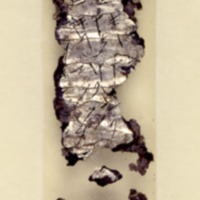 Attempts to date the inscription paleographically (on the basis of the letter shapes) suggest a date between 750 and 700 BCE. If meant to be read top to bottom, the text perhaps reads: Uriyahu the rich wrote it Blessed be Uriyahu by Yhwh For from his enemies by his [Yhwh’s] Asherah he saved him [carving of hand]… by Abiyahu… by his Asherah… his A[she]eraAlmost all commentators agree that the inscription involves Yhwh’s blessing of Uriyahu, but it is not entirely clear if the inscription praises Yhwh for past blessings or expresses a plea for future blessing. The significance of the hand carving is also unclear, although a few places in the Bible associate hands with monuments. Both Saul and Absalom, for example, set up monuments that are referred to in the Hebrew as a 'hand' (1 Samuel 15:12; 2 Samuel 18:18). One of the most interesting features of the inscription is the mention of Asherah. This goddess was well known in biblical times; the biblical texts that use the term Asherah refer varoiously to a goddess or to an object (or, perhaps, sometimes to both, in an elision between the deity and the cultic object meant to represent the deity). When the texts refer to an object, it often appears in close proximity to Yhwh’s own altar. Biblical Hebrew does not usually affix pronominal suffixes to personal names. This has led to suggestions that 'his Asherah' in this inscription might mean the cultic object, rather than the goddess. A few other inscriptions associate Yhwh and Asherah; two inscriptions from Kuntillet ‘Arjud provide an especially useful comparison, as they also refer to 'Yhwh and his Asherah'. *Ghost-letters are traces of letters that can be seen on an inscription but are not properly incised into it. They are often detected by modern cameras that pick up details the human eyes cannot see. Some of the ghost letters on this inscription were probably caused by a person in antiquity tracing the letters with a fingernail, or perhaps a stick. In one of the houses destroyed by the Babylonians in Jerusalem, excavators discovered 53 clay seal impressions ('bullae'). 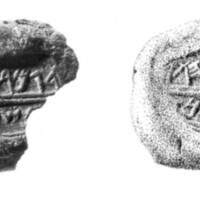 These small lumps of clay, impressed with the seal of a particular individual or official, were used to seal documents, and suggest that by time of the Babylonian destruction in 586 BCE the kingdom of Judah had a group of literate elites, who presumably controlled the administration of the city. It is a pleasant surprise to find, among these bullae, two with likely connections to biblical personages: Gemeriah, son of Shaphan, and Azariah, son of Hilkiah. 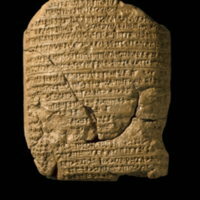 Gemariah's father Shaphan was the chief scribe at the time of King Josiah and appears as a key player in the story of the finding of the law during work in the Temple (2 Kings 22). It is important to note that the term scribe is probably best translated as secretary, and to be understood as a high ranking official as in 'secretary of state'. This Azariah, son of Hilkiah, may be identified with the person by the same name in the priestly genealogy in 1 Chronicles 6:13. Azariah himself is not a major biblical figure but, if the identification is correct, his father Hilkiah was high priest in the temple in Jerusalem at the time of King Josiah, and a key figure in the story of the finding of the law in the Temple (2 Kings 22). 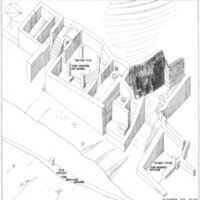 The typical domestic unit in the cities of Judah during the late Iron Age was the four-room house. The House of Ahiel, excavated in the City of David in Jerusalem, follows this typical type: there are side rooms, separated by monolithic pillars and piers, and adjoining service rooms to the north. These service rooms provide good examples of spaces dedicated to food preparation and food storage, as well as the house's toilet facilities.